David Kelly: “Airbags are great devices that have saved thousands and thousands of lives, so I have a very deep, personal vested interest in the issue." WASHINGTON -- David Kelly, the former acting chief of the National Highway Traffic Safety Administration, was hired this week to oversee the 10-automaker consortium searching for the root cause behind Takata airbag explosions. But this isn’t the first time that Kelly has had to deal with airbags endangering lives they’re designed to save. 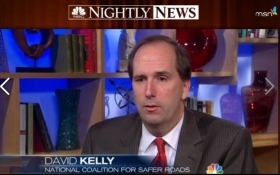 Kelly, 46, got his start in Washington in 1996, when he joined the National Safety Council to work on the public advocacy campaign to reduce the number of kids and small adults killed by passenger-side airbags. The campaign and news coverage about the grisly deaths caused by the airbags prompted parents across the country to put their children in the back seat. As project manager, Kelly will coordinate the work of the 10 automakers looking into the root cause of Takata’s airbag inflator ruptures, which have been linked to six deaths and scores of injuries and have prompted the recalls of some 17 million vehicles in the U.S. since 2008. Kelly will also work with Orbital ATK, the Dulles, Va., defense contractor and rocket-propulsion specialist hired by the consortium to test and analyze Takata airbag inflators retrieved from recalled vehicles. Takata has used ammonium nitrate as the principal propellant in its airbag inflators since 1999. It’s the only major airbag supplier to use the compound, which has intensified the spotlight on the company. Chemical experts have said the compound can deteriorate when exposed to temperature swings and humidity, which can lead to overly powerful deployments. After an early stint in journalism, Kelly has focused his career mainly on transportation and safety ever since he joined the National Safety Council in 1996. In 2003, he went to work for the U.S. Department of Transportation in its government affairs office under then-Secretary Norman Mineta. In 2005, he became chief of staff for then NHTSA-administrator Nicole Nason. When Nason resigned in August 2008, Kelly became acting administrator and held the post until President George W. Bush left office in January 2009. Kelly is now CEO of Storm King Strategies, a Washington, D.C., consultancy he founded that does a mix of lobbying and advocacy work, focused primarily on transportation and highway safety issues. At the company, Kelly says, he has worked with a diverse set of clients, including automakers, safety advocates and groups such as the Coalition of Ignition Interlock Manufacturers. That background will help him as he works with the 10 automakers in their pursuit of the root cause behind Takata’s exploding airbags. The automakers are brutal competitors in the marketplace, each with a different level of exposure to the Takata recalls. The arrangement is highly unusual in the auto industry, and sources close to the group have said a major focus of its early work has been establishing a level of trust between the stakeholders. Yet competing agendas have not surfaced in the consortium thus far, Kelly says.